Seven strangers, escaping reality, meet by chance on a Caribbean island and form a charmed circle of lasting friendships. When newly-qualified London doctor, Joanna Lyndhurst, takes a spontaneous holiday alone on the romantic island of Antigua, her long-term boyfriend, Sebastian, warns her to keep quiet about her job. “It’s a matter of simple psychology,” he tells her. “The world is full of hypochondriacs.” But Jo is not the only one concealing the truth. Among the enchanting and diverse bunch of characters she meets, from widely disparate backgrounds, it turns out not one is quite what they seem. Lowell, the American lawyer, and Vincent, an art-dealer from Amsterdam, have travelled the world in a long-standing relationship, while maintaining separate lives and private worlds that do not overlap. Feisty New York banking executive, Merrily Morgenstern – tough, ambitious and looking for romance – keeps them all in stitches with her lurid tales of Manhattan high-life yet conceals her real anxiety about the threat to her own career. Sandy-haired Jessica, steeped in a world of culture and classical music, mourns a lost love whom she dare not discuss. And Cora Louise and Fontaine, mother and daughter from the steamy South, keep up appearances and dread the exposure of their own murky secret. Set against a splendid backdrop of classical music, and flitting from the sun-kissed Caribbean to the sultry swamps of the American Deep South, to the dizzying heights of London’s Albert Hall, Double Exposure is a hugely entertaining novel combining the charm and wit of a group of friends with a brilliant and nail-biting mystery. 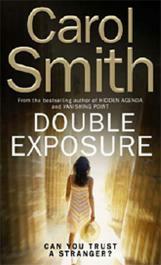 Double Exposure is published as Charmed Circle in the USA.